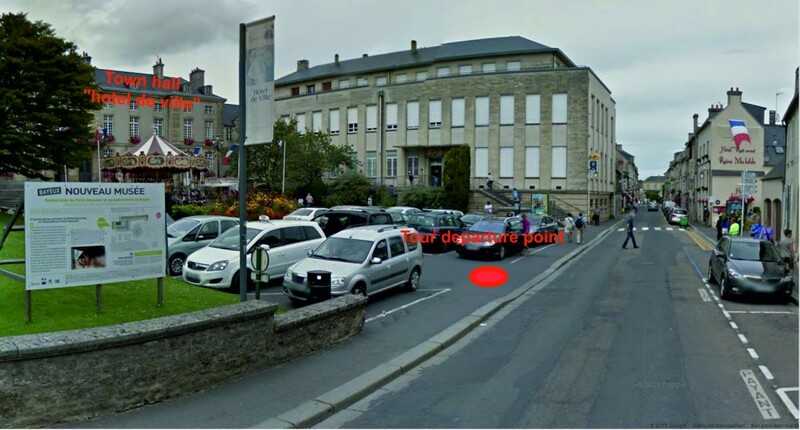 Bayeux Sightseeing Tours pick up Bayeux: car parking in front of the post office / town hall (“hotel de ville” in French), opposite Hotel Reine Mathilde, 23 Rue Larcher. 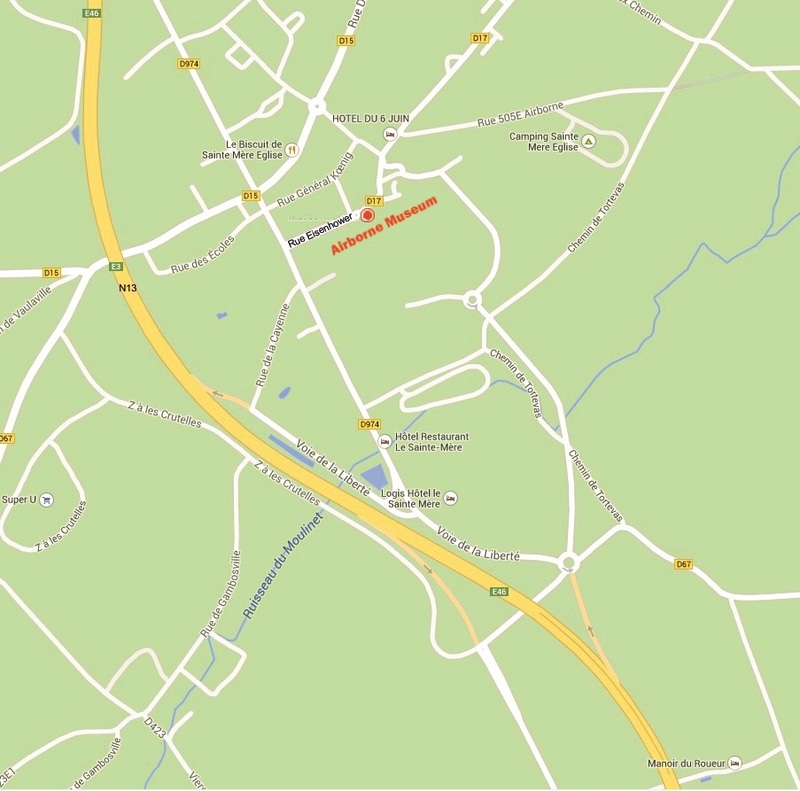 Most of the hotels in Bayeux are within 5min. walking distance of our point of departure of our Normandy tours. 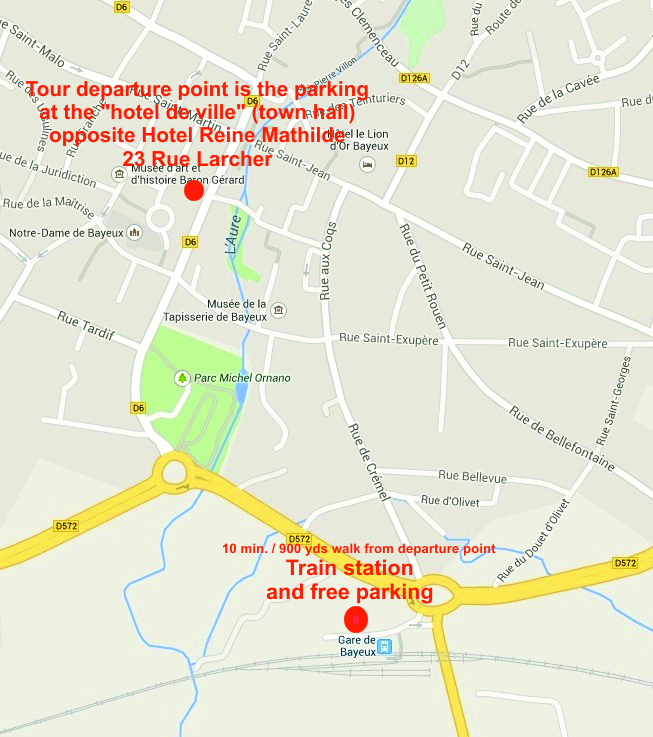 If you drive in by car to join your Normandy D-Day battlefield tour, the best spot to park your car is at the train station. At the station parking is available up to 24 hours. It is free on Sundays only and keep in mind that you have to get a ticket and display it. Our departure point is about 10min. / 900 yds walk from the train station. In case of a shared D-Day tour, please do not ask us to pick you up at the train station or hotel, as this is not possible. You will arrive at the back side of the station. That is where Bayeux Sightseeing Tours will pick you up for your D-Day Tours in Normandy. You can stay on that side of the station, don’t use the pedestrian footbridge to get to the front side of the station. In case of a delay and a taxi is picking you up, they will pick you up there as well. Booking a train ticket: www.sncf.com. Select the English language, go to “reservations”, if you select “ticket collection country”: USA, you will be redirected to another site. Why starting from Carentan train station instead of Bayeux train station, like other operators? 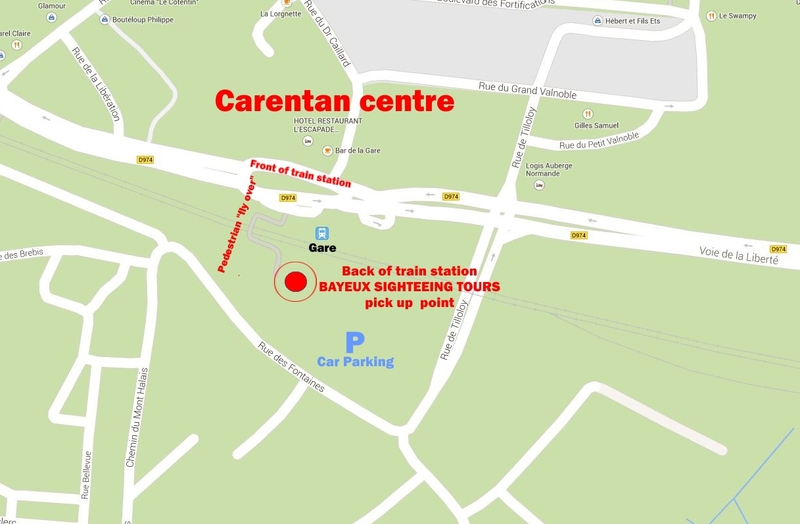 Paris – Carentan is a direct connection, no change of trains. 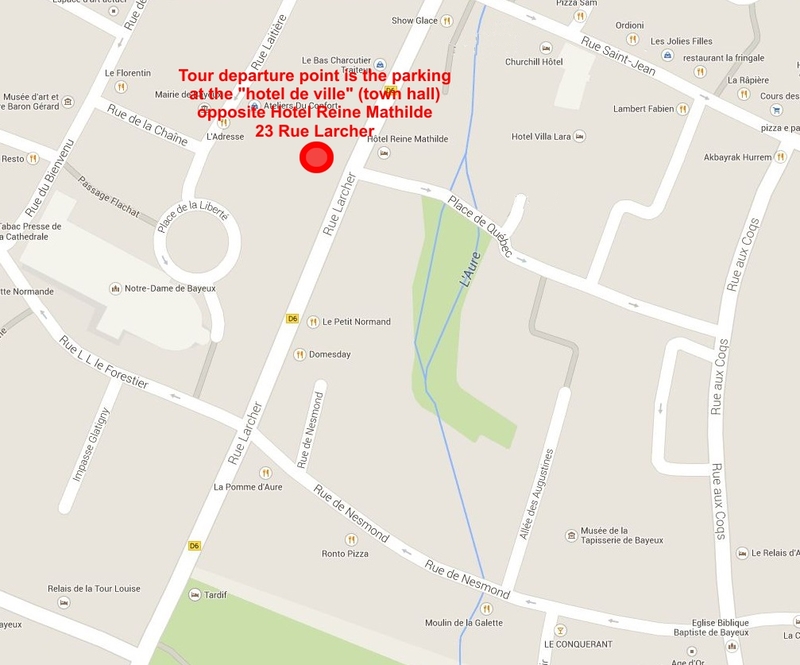 Paris – Bayeux is not! Going to Bayeux, you have to change trains at Caen, with the possibility to miss it in case of delays. Not to mention the extra stress it will cause on your lovely day out for your Normandy tours. 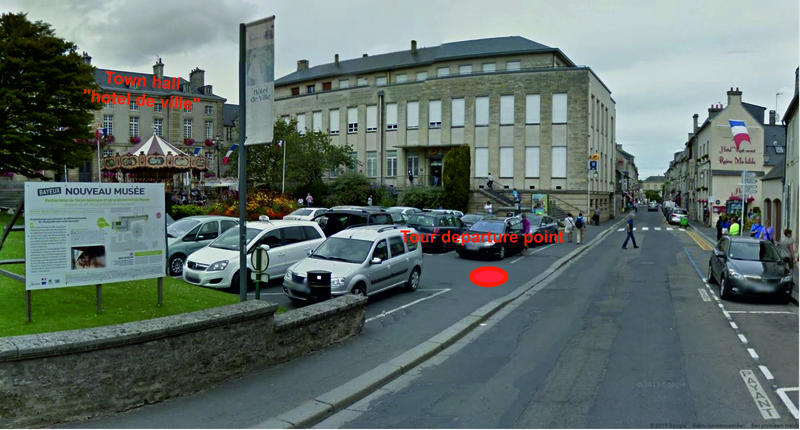 Bayeux is just a pick up point, first point of interest is at Sainte Mère Église. This is the same for other operators. In case of delay and you have booked a shared group tour, we will arrange a taxi waiting at the train station for you, so you can join the tour ASAP. It would not be fair to let others wait when you are late. Carentan – Sainte Mère Église is 10min. by car. * The train schedule for your Normandy tours does not meet our tour schedule on the weekends! In case of a delay and you have booked a shared group tour, please call us ASAP so we can arrange a taxi for you and join the tour. Call: +33 6 70 35 72 10. A taxi from Carentan to Sainte Mère Église is about 32 Euros, which you have to pay for. In case you join our shared D-Day tours from Sainte Mère Église, our starting point is the Airborne Museum at 10:00am. The Airborne museum is located in the very center of Sainte Mère Église, opposite the famous church where John Steele got caught on the steeple. There is plenty of parking space in the front and at the back of the museum. Keep in mind that there’s a fee of 2.00 Euro for a full day (pay and display).